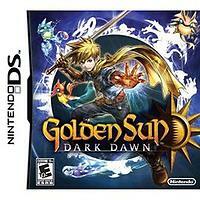 Nintendo's acclaimed role-playing series makes its anticipated transition from Game Boy Advance to DS with Dark Dawn. Taking place 30 years after the first two Golden Sun titles, the DS game finds the world of Weyward undergoing a dramatic transformation. The return of the Golden Sun to the land has resulted in the formation of new countries, exotic species, and unfortunately, new dangers. Mysterious vortexes have emerged that are stripping the world of its elemental powers.The offspring of the heroes from the first two games have agreed to band together and investigate the disturbances, No matter what the cost. As players explore the world, they will encounter an assortment of deadly foes, enticing treasures, and obstacles to overcome. Elemental creatures called Djinn can also be found, allowing characters to summon the magical spirits in combat. Dark Dawn makes use of the handheld's touch-screen interface for movement, spell casting, and menu navigation within the turn-based battles.